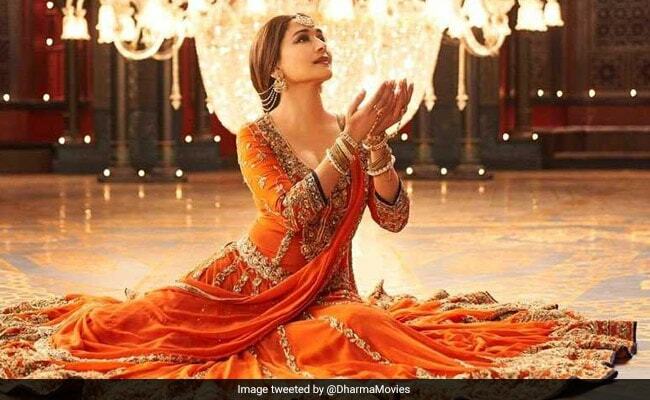 And finally, it's time to watch Madhuri Dixit take the centrestage in Kalank as her song Tabaah Ho Gaye, released on the Internet today. Dressed in an embellished Manish Malhotra lehenga, Madhuri Dixit will dance her way to your heart. The 51-year-old actress is the epitome of grace as she seemingly effortlessly performs Kathak with absolutely stunning expressions. Watch the song till the end for Madhuri's solo piece. In terms of the opulence and grandeur, Tabaah Ho Gaye evokes parts of Bajirao Mastani, "Padmaavat" and Devdas. In an interview with news agency IANS, Madhuri Dixit had said that Tabaah Ho Gaye has a poignant place in the narrative of Kalank. She had said: "The song comes at a very poignant time in the narration when the back stories of each character are unfolding. The song is a quite defining moment in the story." Tabaah Ho Gaye, picturised on Madhuri Dixit, has been jointly choreographed by Saroj Khan and Remo D'Souza. With Saroj Khan, Madhuri has collaborated on tracks such as Ek Do Teen, Choli Ke Peeche, Dhak Dhak Karne Laga and Maar Daala. Remo and Madhuri, who jointly judged dance reality show Jhalak Dikhhla Jaa, have worked together to make Ghagra from Yeh Jawaani Hai Deewani. Speaking of Saroj Khan, Madhuri earlier told news agency IANS: "She knows how to make a woman look graceful and beautiful through a dance... Perhaps that is why every song we did together, holds a recall value even today. If the youngsters are still dancing to those numbers, I think we did something right." Kalank is a love story set in the Forties. Alia Bhatt plays the role of Roop, who marries Dev Chaudhry (Aditya Roy Kapur), apparently in a fit of rage. Dev, who is married to Satya (Sonakshi Sinha) gradually falls in love with Roop. However, by that time Roop has fallen in love with Zafar (Varun Dhawan). Kalank, directed by Abhishek Varman, opens in cinemas on April 17.